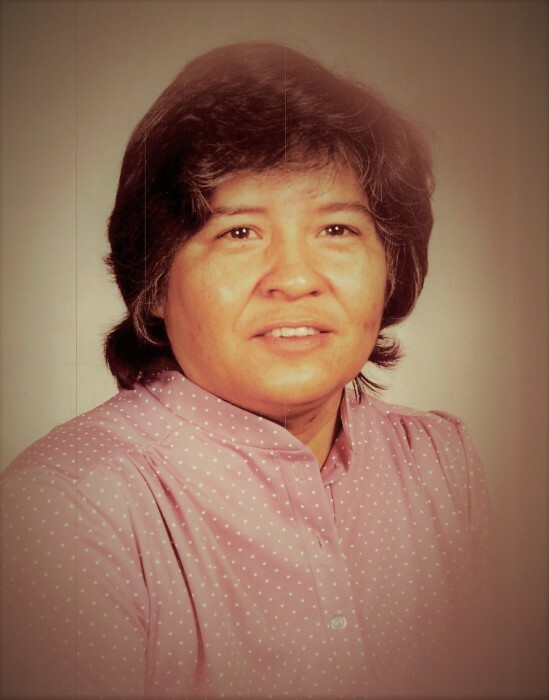 Marcela Sanchez Chapa, 78, passed away peacefully Saturday afternoon, January 19, 2019. Marcela was born a twin and the 6th of 12 children to Hilario, Sanchez, Sr. and Angelita Soliz, in Waco, Texas on January 31, 1940. She grew up and attended schools in Waco. Marcela married the love of her life, Ben Chapa, Sr. on January 26, 1963. After Ben took a job with the Butler Brick Company, in 1965, they moved the family to Elgin, where they raised three children. She was a devoted mother and member of Sacred Heart Catholic Church. She worked for many years as a cashier for Winn’s and Bills Dollar Store, until she and her husband decided to retire together. Marcela never met a stranger; she was a social butterfly, who could talk for hours to anyone. When she wasn’t playing Bingo with her friends and attending her children’s and grandchildren’s sporting events and school functions, she was cheering on her Dallas Cowboys and Texas Longhorns. She is preceded in death by her husband of 48 years, Ben Chapa, Sr.; both her parents; five brothers, Lupe, Abel, Sr., Eli, Lazaro, and Frank Sanchez; and great-granddaughter, Jasmin Reyna. She is survived by her three children, Tina and husband Clayton Thieme of Pflugerville, Ben Chapa, Jr. and wife Karen of Austin, and Susan and husband Larry Chabert of Giddings; her 12 grandchildren, J.J. Reyna and wife Ashley, Phillip Reyna, Nick Thieme, Aaron Chapa, Cody Kemp and wife Jeannie, Justin Skrhak, Jordan Skrhak, Ryan Concienne and wife Chasity, Emily Chabert, Darian Chabert, Kori Chabert, and Presley Chabert; six great-grandchildren, Trey, Jaxon, Jaelyn, Lilly, Grace, and Isabella; four sisters, twin, Petra “Betty” Maynard, Lidia Castillo, Isabelle Mata, and MaryLou McKibben; her brother Braulio Sanchez, Sr.; and numerous nieces, nephews and dear friends. Honoring her as Pall Bearers will be her grandchildren, J.J. Reyna, Phillip Reyna, Nick Thieme, Aaron Chapa, Jordan Skrhak, Justin Skrhak, Cody Kemp, and Ryan Concienne; Honorary Pall Bearers, Mike Grady, Sr, and Mike Grady, Jr. The family will receive guests at the Elgin Funeral Home on Wednesday, January 23rd from 6:00 PM until 8:00 PM with a recitation of the Holy Rosary at 7:00 PM. A Celebration of Christian Burial Mass will be conducted at Sacred Heart Catholic Church on Thursday, January 24th at 10:00 AM with Father George Presiding. Interment will follow at Elgin Latin Cemetery.